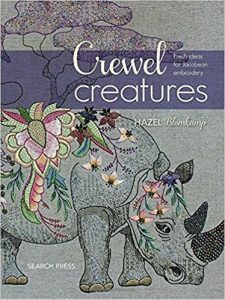 Always a delight to see Hazel’s work and the new slant on crewel embroidery in this book Hazel has transformed 6 animals into crewel creations. The book offers sound advice on embroidery basics including a stitch dictionary, needle stitching and needle weaving and beading techniques, illustrated with line drawings. For each project, you see an image of the design plus close-ups, the dimensions, description, materials needed, general and stitching instructions. These instructions are very detailed step-by-step; for example, Norman the Tortoise has 11 pages of instructions. The other projects are ostrich, owl, snake, elephant and finally my favourite project, shown on the front cover, the rhino. There are templates, but they are not given actual size. Surprisingly the book has no index, although it is fairly straightforward, an index would have been useful to locate stitches and techniques in the book. This book was previously published in South Africa and is the third in a series. Hazel’s work is aimed at experienced embroiderers, who are also interested in beading.